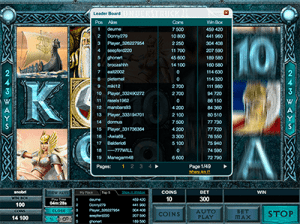 If you’re after a more social way to play the pokies, online tournaments are a great format to opt for. Whether you play in the regular competitions at verified Microgaming casinos, or opt for promotions which take place at multi-provider sites – both options can transform the way you play poker machines on the web. Pokies tournaments are what they sound like – competitions held where you battle it out on the pokies to win a prize. It may seem like an impossible feat to do since most pokies aren’t multi-player. But poker machine tournaments online are designed for one player to come out on top, depending on the casino you opt for. Find a list of pokies tournaments you can enter at Royal Vegas Casino. Microgaming online casinos such as the many we recommend including Royal Vegas Casino, All Slots Casino, 7Sultans Casino, Casino-Mate, and Platinum Play all offer tournaments for pokies player on both their instant play platform, and for PC users who want to download the casino to their desktop. You do need to be logged in to access these games, so if you aren’t a member yet, sign up to one of these sites as your details are protected by secure encryption technology. Then you can locate the ‘Tournaments’ category to get started. 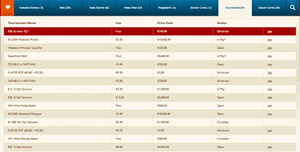 You will find a huge list of tournaments available, with some of the most popular Micorgaming pokies on offer. There’s two different formats, which we detail below, but both involve the basic premise of players unlocking the paytable achievements, for example five of a kind of the low paying symbols, to earn points. You generally need to earn all the payouts for each symbol to win the main prize – the format of the tournament will determine whether this needs to be done in a set period of time or with a set amount. You will also notice some are free to join, while others have an entry fee. This is just like instant play online poker. Some tournaments are free to join. Scheduled tournaments require players to register and either pay a fee, or join for free. You are put straight into the action with these, provided you join one which has been scheduled for the day – which usually is the case. Players are given a set time to unlock as many achievements as possible and when the time runs out the player with the most points wins the huge prize, with runner ups also scoring big prizes. Sit and Go tournaments are the other type of tourneys available at Microgaming casinos and these require a set amount of players to register before the game can start. The player who has the most amount of credits left when the tournament finishes, or after a set amount of spins wins. Prizes generally involve cash and can range from small amounts to huge sums of money, with the main winner and multiple runner ups scoring a prize. Usually the more expensive the entry fee, the bigger the prize but free events can still offer some big prizes too. Scroll through the entry fees and the prizes to work out which is best for you. If you’re new to pokies tournaments, you may even want to pay extra for the entry fee as these can mean bigger prizes for runner ups. Slots Million offers pokies tournaments from time to time. Online casinos offering not only Microgaming as a top software provider, but NetEnt, BetSoft, ThunderKick, Playtech and more, don’t offer the scheduled or sit and go pokies tournaments. But they can offer temporary promotions which see players entering pokies competitions to earn points for a leaderboard. The points can be earned by every $1 wagered, or they can require a set amount to be wagered to earn points. These tournaments can go for days, weeks or sometimes months, giving players a fair chance at playing over time. There can also be multiple leaderboards, refreshing every week with new prizes to be won. Slots Million often teams up with iSoftBet to offer tournaments where you can wager a specific amount to earn points for a leaderboard. At the completion of the tournament, the player with the most points wins the prize on offer. Prizes can range from huge cash amounts to the latest gadgets and even all-expenses paid vacations. Check the leaderboard to see how you stack up against other players. When playing the pokies, there’s no real strategy other than opting for online titles due to their lower house edge in comparison to Australian land-based titles. But when it comes to pokies tournaments, there are a few things to be considered, especially when it comes to paid tournaments. The first tip by many experts is to always play the maximum bet for the tournaments which require you to have the most credits at the completion of the competition. This is since the maximum bet will get you the maximum payout. This also counts for tournaments which don’t require the most credits at the end as the coins don’t matter and you should use them all up in the time period given for the best possible outcome. You should also play fast since tournaments only go for a short period of time – unless you are playing over a long period time but this advice is still recommended to give you the best shot at taking home the main prize. In order to unlock the most achievements or earn points for the leaderboard, you should be pressing spin as soon as the reels stop. Decide whether it’s worth a ReBuy or not. There’s also the option for ReBuys – which allow you to have another go if you don’t think you did too well. But there are times when you should ReBuy and times when you shouldn’t. If you think you’re going well and you can beat the current top scores which are available in the tournament game then you should ReBuy, but weigh up if it is worth it otherwise you’ll end up losing out. If you do ReBuy – if the tournament allows for it – you will be basically starting the tournament again with the same set of rules. 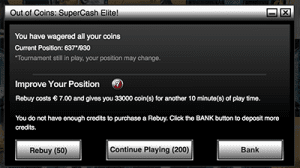 There also may be the option of Continue Play which is similar to ReBuy but your account is just topped up or your time is increased and any wins are added to your Win Box. These options both cost money, but they might be worthwhile – use the information in the leaderboard to determine if it is.